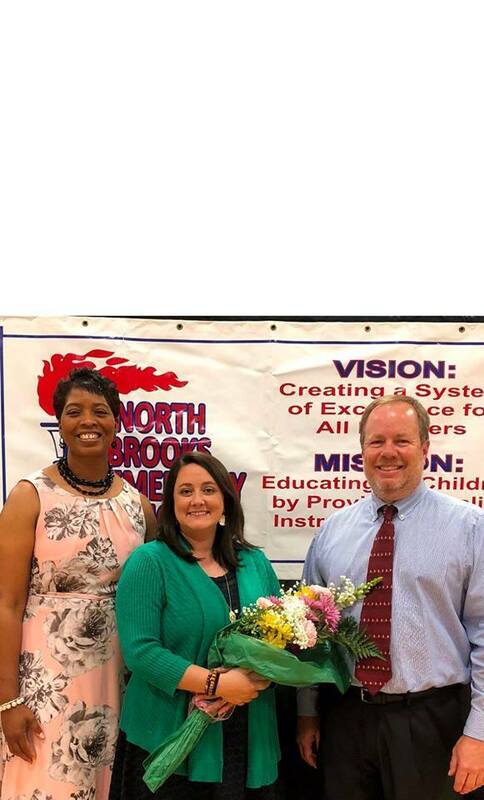 Principal Tara Moss announced at North Brooks Elementary School’s Honors Program that Mrs. Wendy Graham had been selected by her peers as Teacher of the Year. Mrs. Graham said the best part of her job is hearing her students laugh. She stated, “I love watching them master new concepts and knowing that I am making a small difference every single day.” Mrs. Graham graduated from Brooks County High School in 2001. She continued her education at Kennesaw State University and graduated from KSU with a degree in Early Childhood Education. Daughter of OG Carney, Jr, Mrs. Graham is married to Ben and is mother to Payden and Bryton who both attend North Brooks Elementary School. She has been teaching in Brooks County for ten years. When asked about Mrs. Graham, Mrs. Moss stated, “Mrs. Graham is a very passionate teacher. She is a quiet storm that epitomizes our school motto, “Nurturing the brilliance in Every Student” in every way. She can be found providing remediation or acceleration for students before and after instructional hours. She is always excited about learning and goes above and beyond the call of duty.” Mrs. Graham will represent North Brooks Elementary in the district Teacher of the Year competition.